I recently dusted off my Apple TV to give it another chance whirl and see what goodness the latest system updates might have silently delivered. In summary, while there have been some improvements, overall the experience is still underwhelming, and there are major flaws that could easily be addressed. First, a quick bit of history… I’ve had an Apple TV for almost two years since its first release, and frankly have never really used it. I was intrigued and happy to see the announcement a year ago that a major update was on its way (version 2 of the system software) but the fact that particular update wasn’t immediately available meant I am only now putting it through its paces. Looks like I may have to wait another year to reach Apple TV nirvana. The update to 2.3 was my first order of business and took an excruciatingly long time. I don’t know exactly which system software I had before but it was version 1.x something. Your update if you already have an Apple TV might not take so long but be prepared to be patient. At one point I thought the Apple TV had gone into a reset loop – that’s how many times it rebooted itself. If you purchase a new Apple TV you likely won’t go through this step. My first interest was checking out the new ‘video rentals’ section and particularly the HD content. I have an HD TV but with so few channels in the UK available in HD and my decision to wait just a little longer for a Blu-ray player means I’m always on the lookout for new sources of HD content to get onto my TV. With Apple TV you can rent standard and high definition movies delivered over the Internet to your Apple TV box and onto your TV set. The Apple TV connects wirelessly to your home network and connects to your TV via an HDMI cable or, generously, component video connectors. I had an initial problem in that my location within Apple TV was set as being the United States. I could see all the movies that people in the U.S. could rent and buy, but if I tried to rent or buy them myself I received a very unhelpful error message – ‘This title is no longer available’. In trying to replicate this message at the time of writing I see now the message is more helpful and says ‘Your account is only valid for purchases in the UK iTunes Store’. Not sure why or how this message has changed in two days… but it did. To fix the problem I went into the Settings area of Apple TV and changed my location to the UK. I was concerned that the choice of movies and TV shows would now be vastly reduced but was pleasantly surprised to see it wasn’t, and I note this as a huge improvement over the last time I tried out Apple TV. In total there were around 400 movies available in HD and at least 1,000 in SD. Curiously while all were available to purchase, only around 1 in 5 standard definition titles can be rented. All HD titles can be rented it seems. The menu system in v2.3 has changed since the previous version and I’m not sure its any better. A new two column main menu is uninspiring, but functional. Browsing content that you can rent or buy is slick, you see all the DVD covers of the movies in a full screen grid, but navigating around is heavy on the eyes. The thumbnails of the movies move jerkily, there’s no acceleration or deceleration. It’s a subtle thing but it annoys me. The remote control is, frankly, hopeless. This has not changed since the early days it seems, but it should. I understand the wish to make something unique, something stripped down, something small. But this is a case where function should go hand in hand with form, and not be trumped by it. The Apple TV remote should have a more sophisticated iPod like interface or at least some kind of analogue movement control. A few more buttons wouldn’t go amiss for key menu sections. It would be nice if I didn’t lose it so easily (it’s tiny). Apple are probably waiting to have the ability to update the display of the buttons on the remote itself, to be able to do this hand-in-hand with system software updates, and I understand this. But I would take an interim measure in this case, an upgraded remote with dedicated buttons even if those buttons change in future. Typing in anything on the Apple TV means picking out letters on an on-screen keyboard, one-by-one. Frankly I would rather poke hot stakes into my eyes. With the supplied remote control, this is excruciatingly tedious and could be improved by a simple software update. Apple should give us the option for changing the speed of the cursor movement and allow wraparound movement on the letters on the screen. The fact you can do this within the movie rentals sections and not with the on-screen keyboard is, frankly, ridiculous. These simple software updates are however band-aids on the real issue which is for Apple to bring us a vastly improved remote control, perhaps even a universal remote control for all our devices which, with Apple’s skills could finally deliver us from remote control purgatory. A patent application I dug up shows this may be on the way. Apple are clearly thinking along these lines. Incidentally I’ve not been able to find any after-market or non-Apple made replacement remotes for the Apple TV which I find strange. There must be a market for these, and I for one would be a willing buyer if it included a flip-up keyboard. An interim hardware improvement Apple could make is changing the spec for the micro-switches in the remote unit itself. Perhaps they’ve done this already on current model Apple TV’s and I don’t know about it. The micro-switches are simply too stiff and noisy for the job. They remind me of an excruciatingly heavy clutch on an old Dodge truck I used to drive. Fine for cruising the highway, but tedious in traffic. The little click they make each time you press on them quickly becomes infuriating. Getting back to the movie rental experience I’m actually quite impressed. Like a movie rental store you can see movies that are a few months out of the cinemas, and Apple effectively offers the same general 2nd release window that video rental stores, airplanes, hotels, satellite/cable pay-per-view and (recently) DVD sales fall under. That’s the way the movie business works, mainly to protect the livelihood of cinemas. I rented ‘I Robot’ in HD which is a little older obviously and cost me £3.49, charged to my iTunes Store account. A standard definition version would have cost me £2.49, and If I’d wanted, I could have purchased it outright for £6.99. Newer releases such as Forgetting Sarah Marshall were £4.49 to rent in HD, £3.49 in SD, and £10.99 to buy. I had no interest in purchasing any movies as I simply don’t trust Apple to offer the kind of functionality and guarantees I want about my digital purchases. Predominantly this means the ability and right to be able to re-download everything I’ve ever purchased should I mislay my files. Over the years I’ve bought songs and videos from the iTunes Store but now they are distributed over several computers, some of which are retired. I’ve tried to find an option to re-download everything and am able to see a payment history of every purchase and transaction I’ve ever made, but seemingly no way to access them. I would also like a guarantee, even if it meant paying a little extra, that I could download any future improved resolution versions of these files as and when they become available. This is similar to the annoying situation of re-purchasing the same movie over and over again, first in VHS, then DVD, then Blu-Ray etc. As a digital file, and with a centralized purchase registry that the iTunes Store holds, Apple could offer a guarantee of free upgrades to the resolution of the content for an additional fee. High Definition will not be the last word in resolution as I’ve written about before. Also, the current compression codec used on the HD videos is far from perfect. This is a major stumbling block for me. I really would like to purchase a copy of Fantastic Voyage or Star Wars or any number of movies on my all time favourite list, but I don’t want to ever have to do it again in my life, and I’m willing to pay extra for that. Other new features include Flickr integration which works well and let’s you access any Flickr profile photos on your TV without needing to enter a password. There is also MobileMe integration which I did not test. I find the integration between Apple TV and iTunes (on your home computer) extremely baffling. This is a holdover from Version 1 where the Apple TV was really just an extension of iTunes. In that version you would sync your Apple TV with iTunes, and optionally iPhoto, to be able to play back photos and songs on your TV. The problem was the woeful lack of disk space on the Apple TV which meant that (in my case) there was no way I could get all my songs and photos onto the device. There is also no easy or obvious way to delete the photos or songs once they are on the Apple TV. I have a whole bunch of photos on my Apple TV from a sync with a previous computer, and although I can see my Apple TV device within iTunes (on my new computer) I can’t browse or delete the files. Indeed, browsing the Apple TV files only seems possible with a hack. A resync it seems will do the trick, but I don’t want to lose the photos I already have. Another major issue I had was trying to watch a Quicktime file on the Apple TV, something you’d think would be simple considering Quicktime is an Apple format. I put the Quicktime file on a USB stick and plugged it into the USB port on the back of the Apple TV – and nothing happened. The little light on the USB stick didn’t even light up. Why the %$*@ not? Why can’t I play back a sodding Quicktime file from a USB stick??! Annoyed, I imported the Quicktime file into iTunes on my home computer and was able to browse to it within the ‘shared movies’ section on the Apple TV. Just as I thought I had solved my problem I tried playing it back and it had no sound, even though the file played perfectly well on my computer within iTunes. Utterly frustrating, and it seems I’m not alone, and made all the more frustrating by the remote control mistakenly operating my computer every time I tried to operate the Apple TV. 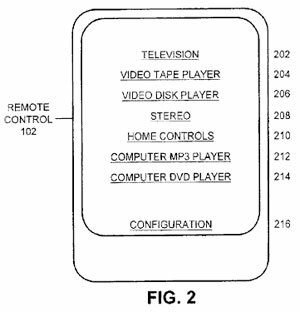 Apple computers and Apple TV share the same remote. I resorted to covering the infra-red receiver on my computer each time I tried to operate the Apple TV. Hardly ideal, but then Apple would get berated for making the two incompatible, so seemingly they can’t win. Solution? Offer two infra-red channels selected by a small recessed switch on the bottom of the remote – job done. With Apple TV you can purchase and download songs from the iTunes store directly on the Apple TV. This came in handy for a recent party where some friends and I were sitting around wanting to hear some specific tunes and my stereo was out of action, but then what? I can’t find any way to listen to them on my computer. I can’t transfer them to my computer, I can’t re-download them to my computer. They are locked away in my Apple TV, seemingly for ever. If I am doing something wrong here, someone please let me know in comments. Questions questions…. Why is there no visualizer (psychedelic visuals) on the Apple TV? The only option you have when listening to music is a photo screensaver. I would have thought that such visual wallpaper would be a central aspect of a ‘TV entertainment device’. If Apple TV is based on Mac OS which it is, there is no good reason not to have this. The code’s already been written for iTunes. Why has Apple not extended the brilliant iTunes radio service to the Apple TV? Now this would be a feature I would use a lot. Overall, unfortunately I am again left underwhelmed and frustrated by the Apple TV experience, and wondering what exactly I will use it for, besides a glorified digital photo frame. On the plus side the movie rental service works well and the selection is good. I can see myself using that. The YouTube feature can be handy if you have friends over, but typing in searches is painful, even with auto-complete which I think is new in version 2. The photo screensaver is cool, and if you have a small music collection I can see the music syncing system being handy in some situations. (Current versions of Apple TV are available with a 160gb hard drive which is much more suitable than the 40gb drive that mine has). My wish list however is extensive. I would like to be able to plug in a USB stick and play back movies, photos, whatever I want, in any format. That would be useful. 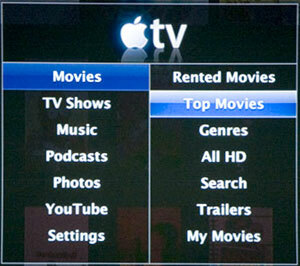 I want a way I can browse my Apple TV device from within iTunes. Finally, and above all… I want a new remote. Next Post vBulletin 3.8 released – does deal with Google?